How can I pay my taxes online using JuanTax? Next up after filing your tax report is the payment stage where you need to settle your taxes. Yes you heard it right -- With JuanTax, you can easily pay your taxes online anytime, anywhere as long as you have internet connection in your device. After Step 1: Filing comes Step 2: Payment that you need to access. In this section are the procedures in paying your filed tax return. 1. Manual - Make sure to enter your payment details. b. GCash - Visit this website to know more. Note: If you used online payments, it still needs be marked as a Manual Payment in JuanTax. 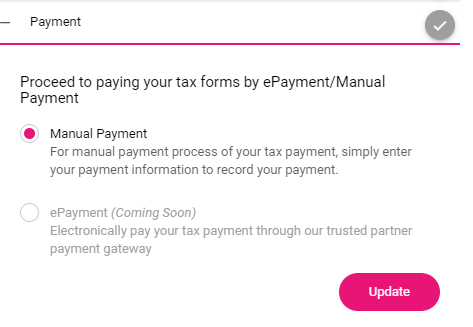 Clicking the Update button will prompt you to a modal where you need to enter your payment, as well as other important information such as Bank, Number and Date. You also need to select your particulars, if it's through: (1) Cash/Bank Debit Memo, (2) Check, and (3) Others. You can also add another payment line by clicking the +Add Payment button. Once you're all set, click the UPDATE PAYMENT button.